HomeNier Automata – First Impression Review. Something about Nier stood out for me during the early footage we were shown. It wasn’t the titillation of the scantily clad lead female, 2B, (though I won’t argue against it), and it wasn’t that I particularly like Japanese RPGs. What got me was the style. The aesthetics. The world. The androids were sleek and gothic, the robots strangely endearing, and the ruined shell of humanity that formed the landscape was eerily beautiful. This caught my attention and, unlike many other AAA games, nothing came up to cast doubt in my mind. So I bought it on release day with little knowledge about it beyond the trailer and a general atmosphere of positive feedback, (buying it on the PC meaning that console players had access to the game for a few days by then). Would I be happy with my choice when there was so much that I wanted to play, or would it be a waste of my limited money? Platinum certainly know how to do boss battles. Here is where things stand. I started up the game Friday night and completed it Sunday night. In this time, I was thoroughly engrossed in the world with hours zipping by seemingly with every blink. No single element stands out as overwhelming or perfect but everything is simply GOOD. This first playthrough took around the 15-20 hour mark and it never felt like it was dragging. What is more, Nier Automata uses the New Game+ system in a way that fundamentally changes the game. Apparently there are different events and characters depending on how many times you have played through the game. I’ve only had chance to play for an hour in New Game+ and already I am a different character playing different missions. This potentially multiplies that 15 hours by three or four playthroughs as you delve deeper into the story, peeling back the narrative each time to further your understanding of events. Nier Automata is an interesting game from a mechanical point of view. On the whole it is a fast-paced action game set in an open world. Your character can equip a combination of any two weapons that you find/buy to change the way your moveset plays out during combat. On top of this, you also have your floating pod who serves as another customisable secondary weapon. You can charge attacks, evade any attack with the press of a button and alternate weapons and abilities with ease to feel like a god of death to your enemies. I never felt overpowered though. Enemies cut down your health quickly and the dodging can take some getting used to, especially when facing crowds. You can get stunlocked by chain attacks, though usually these are fairly short combos, and once you start attacking it is hard to pivot in place between enemies, meaning you cannot attack in every direction mid attack. This forces you to be more selective and reliant on dodging rather than beating back all attackers. A little look at the haunting beauty of post human Earth. Like all RPGs, your character levels up, but the key difference in Nier Automata are the combat chips. In most RPGs players can pick armour for different effects but in Nier this is done through chips that are added to your android. These can upgrade all sorts of stats like movement speed, health, attack range and power, or give cool effects like auto use healing items or regenerate health when not in combat. Like with the weapons, these can be mixed and matched in limited slots to adjust your character for differing situations or play styles. Nier also handles death slightly differently to many games, taking the Dark Souls path of death not leading to a game over or checkpoint but an in-game event where our body is left at the scene where it can be recovered. If you die again before recovering your body you will lose any combat chips that you had equipped at the time. It also takes the Dark Souls approach to other players, leaving the dead bodies of others in your world to search for chips or repair to fight alongside you. This looks especially cool when you enter an area littered with corpses indicating a tough fight ahead. The main thing that makes Nier stand out from a gameplay point of view is its constant playing with how certain areas playout. As I said before, the game is mostly open world but it will regularly switch to a fixed camera to turn the game into a 2D side scrolled, a Diablo like dungeon-crawler or a bullet-hell shooter. I personally found this a little frustrating as I am not good at these types of games and the limited camera makes it easy for enemies to attack you from out of view. It can also be quite jarring when the camera suddenly is taken out of your control without warning. That being said though, it did keep the game varied and was interesting to play, and I did eventually get used to the mechanics to feel competent where before I was simply terrible. Top down gameplay in a AAA action RPG? For me, through the first playthrough, (I have no doubt that characters will be given more depth in New Game+), no characters stood out as great, but again there was a lot to be enjoyed, especially among the supporting characters. The protagonist, 2B, is the stoic, straight talking badass type that we saw with Final Fantasy XIII’s Lightening. She did have moments of emotion but they always felt out of the blue and overreacting when compared with her usual pragmatism. She didn’t really have any driving motivations, her role being a mechanical soldier ordered to fight against an army of robots. Again though, I have reason to believe that this will be expanded upon in later playthroughs. 9S serves as the secondary character and the foil to 2B’s serious nature. He is more talkative and sensitive but shares many of the same shortcomings as 2B. The two form a close bond very quickly and create an artificial drive through the story as the two fight to protect one another without any real build-up as to why they would feel so strongly. 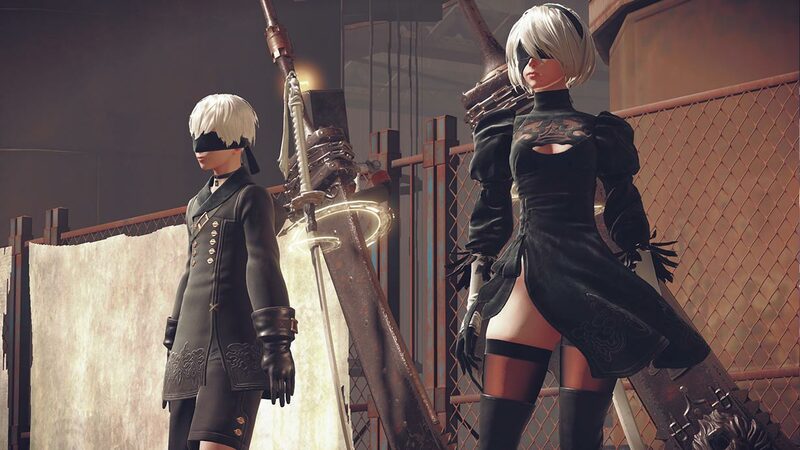 Our protagonists 9S (left) and 2B (right). Much of the fun comes from the side characters who don’t really have an impact on the main story but who make the potentially boring side missions memorable. Each character feels fully realised with a developed backstory even if they only have a few lines to say. You can certainly tell that it is a port. The options are fairly limited but the game does run well enough. I have a slight issue where the game starts in windowed mode no matter how often I specify fullscreen and there is no obvious way to go boarderless windowed mode. The game also dips slightly in framerate when things get hectic but it was never unplayably bad. I did have the game freeze on me once but other than that I’ve had no other issues. I really enjoyed my time so far with Nier Automata and I expect to enjoy it even more for a good while longer yet. Combat felt challenging but not painstakingly difficult, the world was varied and beautiful and the story left me wanting more. It doesn’t feel like a sequel and certainly doesn’t require you to have played the original Nier to understand everything. I watched some recaps of the first game after completing it and so far I have only noticed three characters who overlaps, all of which are merchants. I think that Nier Automata has a little bit of something that will appeal to everyone. My only criticisms are the stunted character development and how quickly the story escalates through the second half of the game, both of which I am confident that the New Game+ will resolve. It is a solid 8/10 that tries to do a lot and doesn’t fail at any of it. It may not be a game of the year but it is a wonderful experience that I believe to be worth the release retail price. It is definitely worth picking up if you have the chance and it has my full recommendation. After completing the game 100%, I have written two more articles on Nier Automata. Feel free to check the links below for my thoughts post Ending E.
← The Nintendo Switch Needs to Switch up Nintendo. Good post. This game seemed to have snuck up one gamers because almost no one expected it to be this enjoyable. These last few months have been sooooo busy with all these great releases, so I’ll probably have to give this game a go once the summer gaming droughts hit. Thanks for the comment. It is definitely a good game. My favourite since The Witcher 3, though admittedly I haven’t had the chance to play any of this year’s releases yet.Apparently I’ve only just scratched the surface too. The second half of Nier’s story is locked behind New Game +2 or something, haha. I plan to do another article when I fully complete it. Haha yep, be prepared to play through it quite a few times. My colleague is still going through his copy and he’s told me that the games has many, many, different endings to see. I don’t currently share my writing with other sites though I am not against the idea. Feel free to send me some info to matthewroys@gmx.co.uk. I’ll certainly have a read and consider it.